India looks at a new multi-role combat aircraft to replace the current Su-30 fleet. Saab offers Sea Gripen to Indian Navy. Saab took occasion of the Singapore Airshow to respond to the Indian RFP for a new carrier-borne fighter aircraft, by offering the new Sea Gripen. The Indian Navy intends to purchase 57 multi-role fighter jets to replace its current fleet composed of Sukhoi Su-30 aircraft. The timeline has not been released, but the Indian Navy Chief Admiral Sunil Lanba said in a previous statement that the new fighter will be embarked on the first Indian Indigenous Aircraft Carrier (IAC I) that will be ready by 2020. The Swedish aerospace company started the development of a navalized Gripen, called Sea Gripen, about 5 years ago, in order to respond to future requests for embarked aircraft. 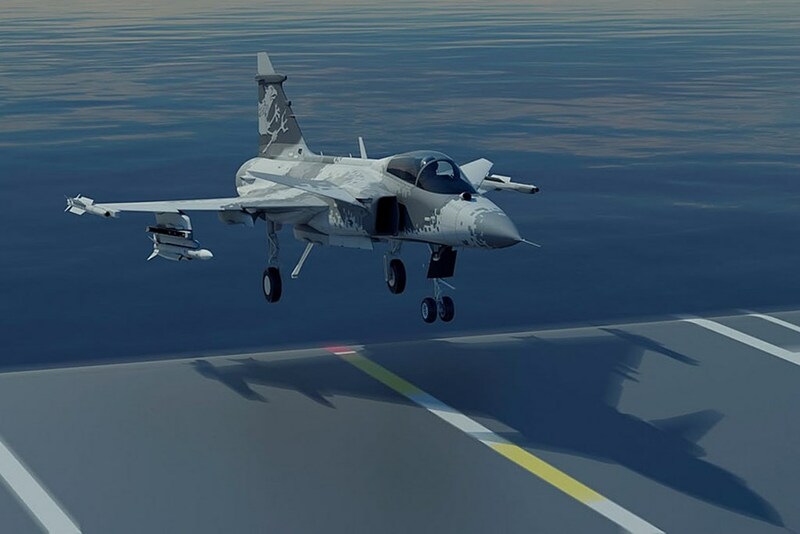 According to Saab, the Sea Gripen will have all the capabilities of the Gripen E/F, and will be the most technologically advanced fighter aircraft in the world in its category. The aircraft will be highly agile, have supercruise capability, extended reach, netcentric capability, carefree manoeuvering, advanced data link and an extensive electronic warfare suite that can be adapted to meet specific national user requirements. The Sea Gripen will also have superior sensor fusion abilities, the Selex Raven AESA radar, Infra-Red Search and Track, plus a revolutionary avionics architecture including ultra-fast databuses and Ethernet. The platform offers for easy integration of advanced weapon systems and growth potential. Aircraft carrier capabilities such as low landing speed, high pitch & roll authority, high-precision glide slope control, high-precision landing capability, high sink rate clearance, strengthened airframe etc., are built-in from the beginning in the Gripen E/F platform. The Sea Gripen is intended for both CATOBAR as well as STOBAR operations. All the sensors, avionics and weapons and the GE 414G of the Gripen NG will be offered in the Sea Gripen. The small logistic footprint, high availability and a smaller, lighter airframe results in significant gains from a maintainability point of view. The Gripen spares inventory is therefore lighter, smaller and adds less to the load of the carrier and it takes fewer personnel to maintain the aircraft.